Coffee plays a huge part in many women’s daily routines (some would dare say that they couldn’t get through a morning without it! ), but its role is a little different in the life of Nyakio Grieco. 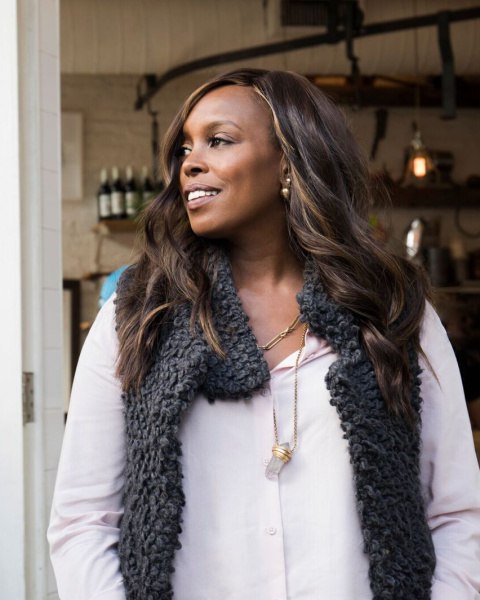 The 45-year-old entrepreneur has had a relationship with coffee since she was a young girl — and inspired not only her love of beauty, but her career. “My namesake paternal grandmother was a coffee farmer,” she tells Spotlyte. Grieco spent her summers as a child visiting her in Kenya, where her grandmother taught her to crush coffee beans and rub them into her complexion using a piece of sugarcane to remove dry skin. Her maternal grandfather was a medicine man who extracted oils from natural resources to help treat skin. Though she has always been diligent in caring for her skin, she only recently started incorporating regular treatments into her routine. “I get facials every four to six weeks to recharge my skin,” she explains. “The magic hands of Los Angeles facialist Shani Darden keep it glowing.” Grieco has noticed that getting consistent facials helps her maintain younger-looking skin. When she has time, she enjoys Crystal Crown Chakra Goddess treatments from LA-based acupuncturist Chandra Scofield, as well as the Buff and Brown Sugar Polish Hydrating Body Treatment at Wi Spa® in LA’s Koreatown for head-to-toe radiance. Gorgeous skin also comes from treating your body with care, and Grieco clearly knows that. She tries her best to get seven to eight hours of sleep a night and takes natural supplements daily that help to “balance my hormones, provide the vitamins I need, and give me the energy I need to live a very busy life.” She stays active physically and mentally with LEKfitSM (a dance-inspired fitness method) and meditation. Grieco hasn’t tried cosmetic injectables, but says “never say never.” She adds, “At this point in my skincare journey, I’ve been able to keep my skin healthy by using cold-pressed oils and natural, clean and green ingredients.” In fact, she credits her healthy-looking complexion to moisturizing religiously. The entrepreneur won’t leave the house without slathering on a nourishing, cold-pressed oil. Oil is just one of Grieco’s many beauty secrets. Because we selfishly wanted to recreate her routine for ourselves, we asked her to share the top 11 products in her regimen.